Georgiana MacDonald came from a strict, God-fearing family. Both her father and grandfather were Methodist ministers. According to Jan Marsh in Pre-Raphaelite Sisterhood , reading the works of Shakespeare and attending the theater were forbidden and considered sinful in their family on the grounds of morality. ‘Georgie’, as she was known, was the fifth out of eleven children. 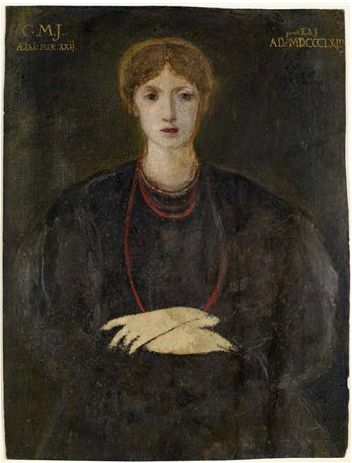 Georgiana married artist Edward Burne-Jones. Her sister Alice married Edward Poynter, a painter who eventually became Director of the National Gallery and, later, President of the Royal Academy. Their sister Louisa gave birth to future Prime Minister, Stanley Baldwin, and another sister, Alice, was the mother of Rudyard Kipling. Georgie had known Edward (known as “Ned”) since she was a child. She adored him, looked up to him. Compared to her strict upbringing, Ned’s world of art may have been exciting for Georgie. 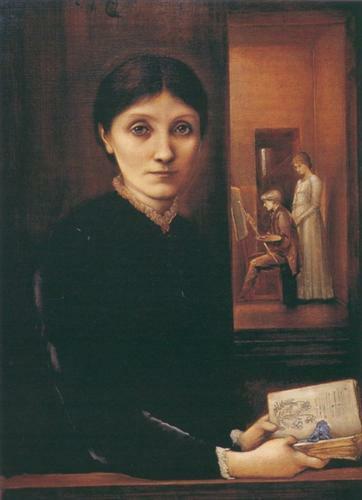 At the beginning of their engagement, Ned introduced Georgie to Rossetti, Millais, and William Morris. In later years, Ned had a widely known affair with Mary Zambaco(see The End of the Affair). At the same time, Georgie had a touching, yet seemingly innocent, relationship with William Morris — while his own wife was famously carrying on with Dante Gabriel Rossetti. Have you read her biography of her husband? Georgie was the focus of part of my research for my thesis, and I read the Memorials of Edward Burne-Jones, cover to cover, and came away absolutely in love with Georgie. She often gets forgotten in all the hoopla around the “stunners”, but she was a stunner herself, in a very quiet way. .About the Zambaco affair, I always found slightly hilarious — though of course sad as well — the image of Maria Zambaco threatening to throw herself into the Serpentine river, right in front of Robert Browning’s house. I always wondered what the great poet would have thought looking down at that from his window. Might the poignant scene have found its way into one of his poems? I saw this portrait of Georgie at the home and studio of the Victorian artist Frederic Leighton. There is a likeness with the ‘beggar maid’ in the Cophetua picture. Also in Leigton’s studio is a gouache study of the beggar maid and for me that likeness is even more pronounced in the study. Thanks for this great post! I know very little about Georgie, so this was a real treat!